I'm a fan of the Harry and the Hendersons movie, but I have to be honest, I totally forgot that they made a television series out of it that ran for three seasons starting in 1991. The sixth episode of the first season entitled "The Father-Son Game" featured both Ken Griffey Sr. and Jr. 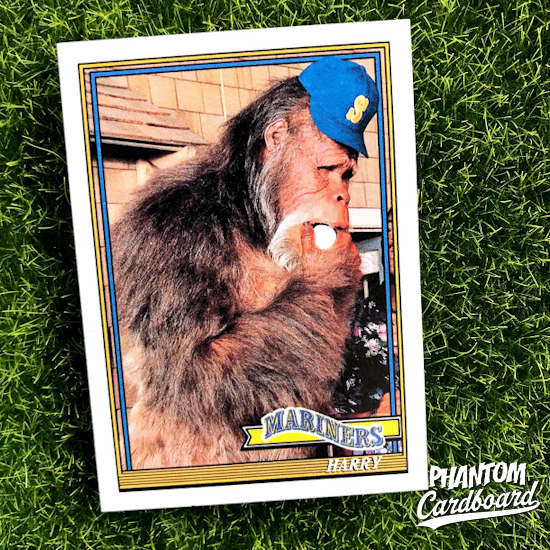 I can't tell you too much about the episode other than regurgitating its IMDb page, but I can tell you I think it makes for a pretty cool Harry custom baseball card. This one is in the style of the 1991 Topps baseball set. I had actually done this design previously with a few football cards from the movie Necessary Roughness that I have yet to post. Topps used basically the same design for baseball, hockey and football in 1991. It's a fairly simple and clean design but I do recall it taking a lot of time to recreate due to all the line work in it.